MEDIA RELEASE REGARDING SATURDAY STRUCTURE FIRE NEAR 7TH AND ST. LOUIS #JoplinNewsFirst was there thanks to your tips! ARE YOU SMELLING SOMETHING AWFUL TONIGHT IN SOUTH JOPLIN? 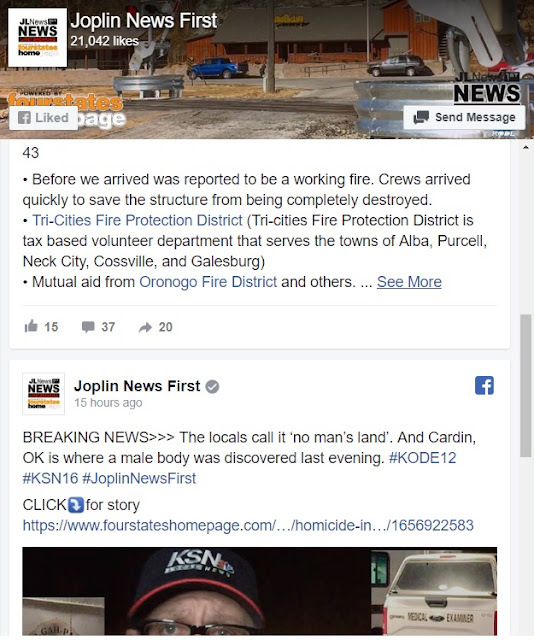 WATCH JOPLIN NEWS FIRST WITHOUT FACEBOOK! JUST BOOKMARK THIS BROWSER LINK! WATCH JOPLIN NEWS FIRST WITHOUT FACEBOOK! CLICK RIGHT HERE, ANOTHER WINDOW OPENS, THEN SAVE THAT LINK ON YOUR BROWSER! spotify music - What subscriptions do you offer? Click a subscription type for more info, including how to join or switch to it. Travel abroad with your music. known as the Spook Light which has haunted locals for centuries. 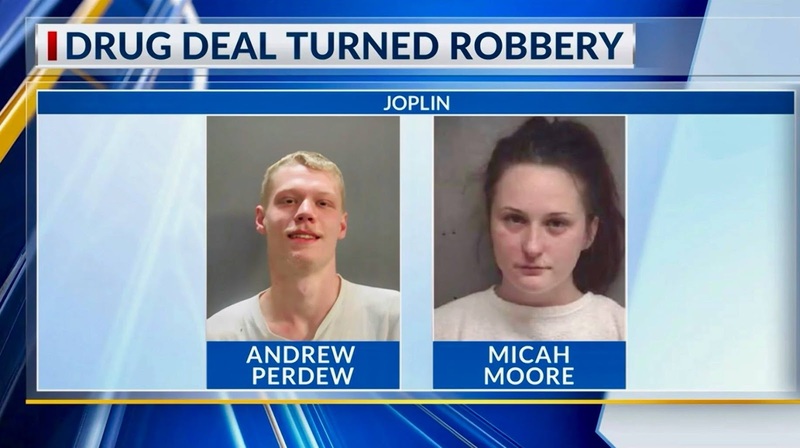 CLICK >>> Joplin Police Department, Capt Trevor Duncan with official information: Joplin News First spoke exclusively with Capt Trevor Duncan live. Standing on E 23rd St just steps away from where a man was spotted with a handgun earlier. It's believed shots were fired from that handgun. Report of shots fired 900 block West 3rd Street, no solid leads: ”Oh yes it definitely was” - shots were fired, Sgt Clay Collard of JPD tells #JLNews. In the 900 block West 3rd, between Conner and Gray. JOIN THE PRIVATE FB GROUP THAT PEOPLE DON'T COMMENT AND STIR UP ALL THE DRAMA. IT'S MORE OF A BULLETIN BOARD. The majority of tips and stories we follow are not newsworthy to all of Joplin. However it might be important to some. This page will act as a bulletin board to let you know what is happening at any given time - up to the minute. This group is when you hear sirens? You see police entering a store? You are concerned? You don't see it on our main page? Check here first. This group is for your eyes only. It is not to be shared in a mass CLICK by sharing. That can be done at our main page. highway patrol so plan to not cross paths with the convoy! Ozark Center Crisis Line is for you or someone you know - When should you call the crisis line? • Teacher was on parking lot in the horseshoe pull-through for parent pick up, the bike racks and students who walk home. (64850) — :::UPDATED INFORMATION::: Neosho Police Chief David Kennedy spoke with Joplin News First at the scene. He told us this investigation has just begun and will have information as soon as it is available. Chief Kennedy also was kind enough to provide us the press release from the school district. In part, Benton Elementary is dismissing classes the rest of the week. The Neosho School District will have a press conference tomorrow at 10:00AM. Counselors are available for staff and students. (64804) -- IT’S OPEN NOW!!! Only two lanes and a sidewalk on the West are accessible. 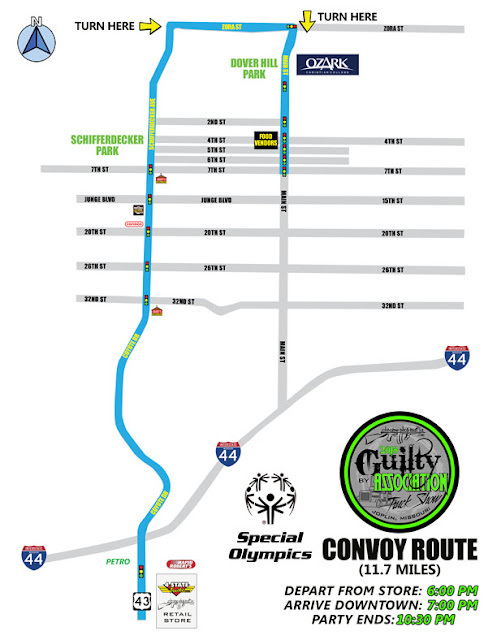 The East side won't be connected until the road is widened as part of the project. "Now that it is open we [First Baptist Church] won't have to drive through the DIAMOND OF DEATH," Kim Conroy tells Joplin News First. She's referring to the South Rangeline traffic diamond. "The women in my class at church talk about it all the time." We didn't know the next phase in the project so we asked Chris Sloan, Senior Minister at Christ Community United Methodist Church. "A roundabout at 44th and Connecticut." Thanks to our #JLNfriends Amanda and Martha! 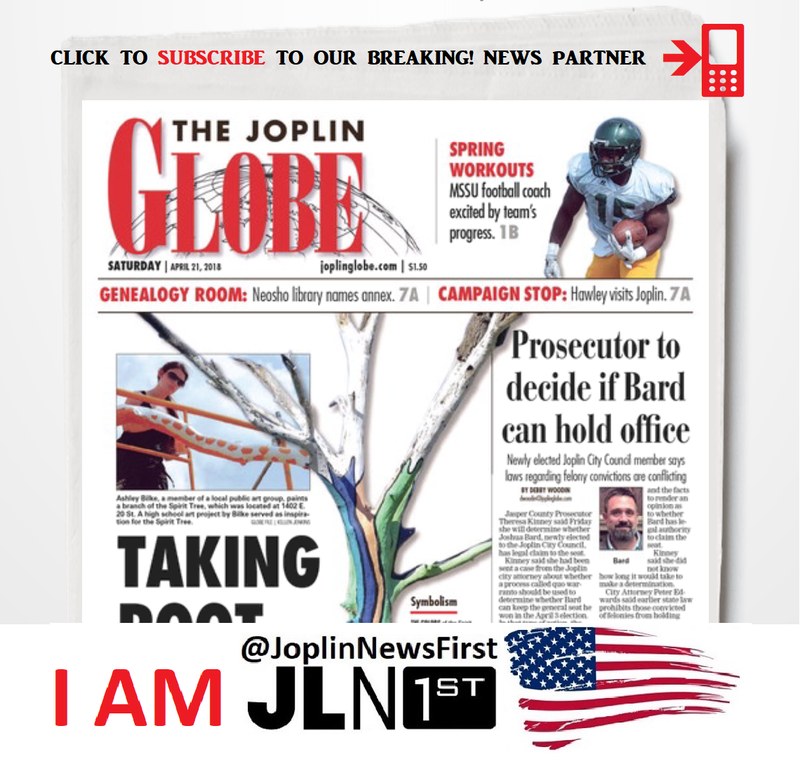 You are Joplin News First.